We love swimming in the ocean and snorkeling. 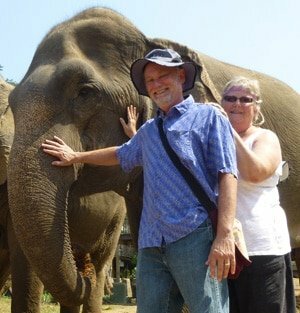 We have snorkeled in Bali, Costa Rica, Mexico, and on the Hawaiian islands of Oahu, Kauai and Hawaii, as well as in California and Florida. Being able to have a fun and safe swim in the sea is one of the true pleasures of traveling for us and you don’t have to be uber fit or young to enjoy a snorkel adventure! Many folks have asked us about the dangerous creatures in the ocean and if we were afraid of being hurt. Like many subjects, there is a lot of misinformation and fear mongering about the dangers of going for a swim, but there are also some real perils! One of these dangers is being stung by a jellyfish. In our many years of snorkeling, we only experienced this once. While snorkeling in Pemuteran on the island of Bali in Indonesia, we suddenly experienced what felt like small electric shocks on our arms and legs. It was uncomfortable enough to cause us to leave the water. After speaking with a local diver, we learned that there were sometimes almost invisible little jellyfish off the coast off Bali that could sting you. 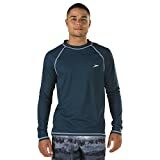 Although we weren’t really hurt, the experience prompted us to do some research and we soon purchased rash guard shirts for each of us and a jellyfish sting preventive lotion called Safe Sea. 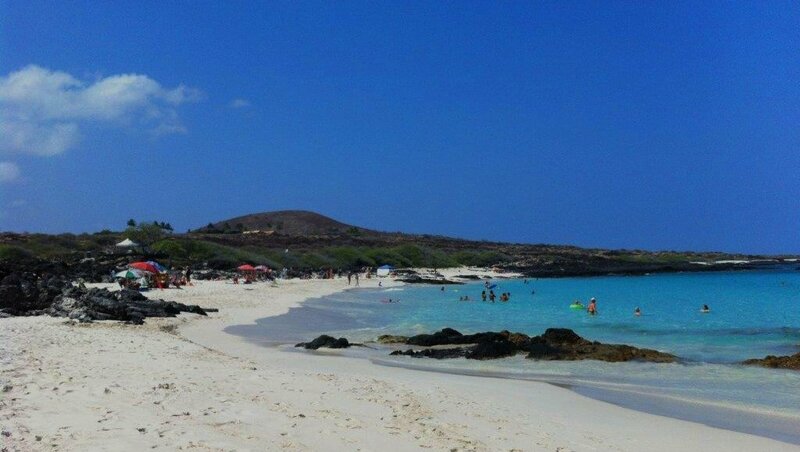 The Hawaiian islands are one of our favorite places to snorkel. We have done lots of snorkeling there and think it has been some of the best snorkeling in terms of seeing lots of varieties of colorful fish and beautiful coral. We were aware that there were times that box jellyfish were present in the ocean on east and south facing beaches and have seen signs posted on the beach warning swimmers away. In February 2016, we read an online article about an increase in box jellyfish in Hawaii, published by Beat of Hawaii. It is good to have an article like this one to help you know what to look for, best times to schedule your Hawaii vacation, and how to treat stings if you are unlucky enough to get stung! You can read it here. There are specific times when the jellyfish show up off the south coast of Hawaii. They are correlated with the full moon (usually eight days before a full moon). The predicted dates for 2019 are below. 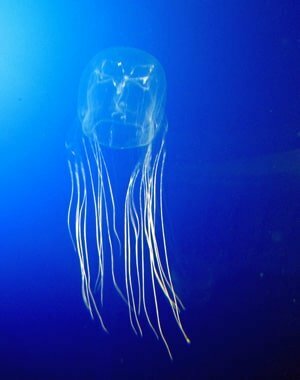 The box jellyfish usually appear 8-10 days after a full moon. You can check the date of a full moon and count eight to ten days after that. Also be cautious a few days before and after the danger time. Besides knowing these dates, it is a good idea to walk on the beach before going in the water. If you see the dead jellyfish on the beach, don’t go in and notify any lifeguards so they can post warnings. Asking locals can also be a good way to make sure there are no jellyfish present in the water. Playing in the oceans of the world is one of the reasons that we are long term travelers. Outdoor activities require people to respect nature and use common sense and precautions to stay safe and have fun. By being prepared for challenges, you can enjoy yourself and not be at risk. 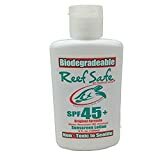 We have added rash guard shirts and Safe Sea, a jellyfish sting prevention lotion, to our travel gear along with sunscreen, and our masks, snorkels and fins. Watch this video if you want to learn more about how a jellyfish stings you. It is a bit long, but I found it fascintating. 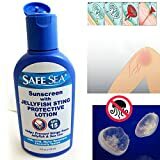 These recommended products will keep you safe in the ocean from jellyfish stings and safe from the harmful rays of the sun while not damaging the coral reef. We rely on our rash guard shirts. They keep the sun off us while we are in the water as well as on land without having to rely on sunblock. 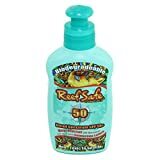 Many sun block products can be damaging to coral, a huge ecological problem, so wearing less sunscreen is always a good idea. Our time snorkeling in Australia was eye-opening. The jellyfish in Australia are extremely dangerous, in many cases, deadly. In warm weather, during the “stinger season”, all snorkeling providers in Australia issue what they call “stingsuits” to all snorkelers. 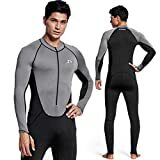 These are full body rash guard suits, that protect the whole body from jellyfish stings. They also encourage snorkelers to use gloves, booties, and head covering. 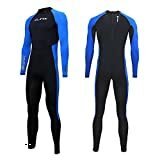 We purchased our stingsuits on Amazon before traveling to Australia to snorkel the Great Barrier Reef. We really felt confident in the water with our bodies covered. ← Is Travel to Japan Safe and Free From Radiation Exposure?